All I want right now is to be a very good mother. Not the goody goody one whose goodness he will love and take advantage of, rather someone who is firm enough to teach him whats good and whats bad and whose goodness he will understand and aodre as a grown up. sounds Confusing??? That's what I am right now. Ok, I know all mothers, well most mothers (not sure of the moms I read about in novels) wants to be as good a mother as they could. That’s is something that comes to us effortlessly. We love our kids to death and do whatever is possible to make them happy. But sometimes that is not enough and I realized it very recently. No its not an idea that came to me out of the blue but something happened that made me realize that something might be wrong. Last week little ‘R’ had a function in his pre-school. His teachers gave us some options for his makeover and he wanted to be a kitten or a bunny. It was a very proud moment for us as parents too. Our little one’s first stage performance and we were excited to see him on stage. Everyday after coming from school he would show us the new steps that he learned and we cheered him. On the day of the show the scene was different though. The little bunny looked cute and adorable but don’t know why he dint stick to what he was tought. On stage he did whatever he wanted to, he sat down, he jumped and hopped through the stage. Almost 90% of the kids were quite scared of the big stage and the colourful lights. Most of them stood still through the whole act some of them even started crying. It was good that my son was not scared but what we are worried about is his indiscipline. At home he listens to whatever he is told (most of the time) and everyone around us thinks he is well behaved. He has his moments when he puts his feet down and refuses to do anything but then he is not even 3. we cant expect him to understand everything so well. I am little confused as whether to take this incident seriously or just let it go as a kid’s whim. Its not like I want to dictate or decide his path of life. All I want him to grow up to a responsible person. I can guide him to the right path but cant force him to be the person I want.Iits not like am threatened by that small incident. But somewhere I feel that its time to pull the socks up. We have to be more consistent with our behavior, the routine and in disciplining him. While I figure that out here is another light dish for you to enjoy. If you like fish then you definitely are going to like this. What makes it special is the use of fresh vegetables in this. Predominantly a winter fish where loads of tender cauliflower, new potatoes, fresh juicy tomatoes and coriander leaves are added. I can still remember our excitement as kids when in early winter this dish used to make its first appearance on the dining table. Ma always makes it with the veggies from her backyard. But now that these veggies are available the year around make this light, soupy jhol any time you want. And that’s exactly what I did as a following course for my light spring meal that I shared earlier. Wash the cauliflower under running water and soak in salted water for 10 minutes. Wash the fish pieces and smear with salt and turmeric. Keep aside for 10 minutes. Mix the ginger paste, cumin-coriander-chili powder in 1/3 cup of water. Keep aside. 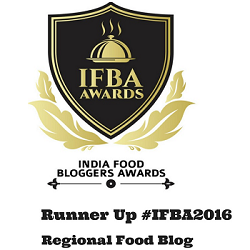 Heat 2 tbsp of oil in a heavy bottom pan or kadhai. Once it’s smoking hot carefully place the fish pieces one by one. Fry till golden brown on each side (3-4 minutes on each sides). Drain and keep aside. In the same oil add the cauliflower and potato pieces with little salt and turmeric. Fry till light golden in colour. Drain and keep aside. Now add the rest of the oil in the same kadhai. Once its hot add the onion paste. Fry on low till the raw smell is gone. Now add the ginger and powdered spice mix, pinch of salt, sugar and turmeric. Fry on low till oil start to separate at the sides. Now its time to add the tomato. Cut the tomato in quarters and add to the spice mix. Fry till its soft and mixed through the spices. Now add 2 cups of war water. Mix. Checks the seasoning, add the fried vegetables, slited green chillies and cover. Let it boil. Once the veggies are cooked add the fish pieces. Cover again and let it soak all the flavours. Check the seasoning for the final time. Finally sprinkle chopped coriander leaves. Cover and let it stand for 5 minutes. Serve hot with steamed white rice. 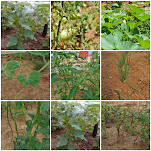 Vegetables take different times to get cooked and might require varying quantity of water. Please adjust the quantity of water according to the amount of gravy you want in the final dish. Now that my little one loves this dish I prefer to fry the green chilies separately and serve along with the jhol. Some people like to cook it without onion as well. In that case increase the amount of ginger paste and dry powders to maintain the consistency of the gravy. fish, rohu, rui macher jhol, katla, carp fish curry, light fish curry, bengali style of cooking, bangali macher jhol, bengali fish curry recipe, juicy curried fish. halka macher jhol, phulkopi die mach, cauliflower and fish curry, vegetable and fish curry, indian fish recipe, how to cook light bengali fish curry, sweet water fish recipe, easy fish curry, winter special fish recipe, fish with winter vegetables, firm fish in tomato onion gravy, coriander flavoured fish gravy, best fish curry recipe, bangladeshi fish recipe, east indian fish recipe. curry looks inviting... my kind of meal . Another of your delicious and mouth watering preparation. Sayantani - don't sweat over little 'R's behaviour. It is pretty normal and a passing phase. But you are right as mothers we want the best for our kids. Just have to guide them and teach them right from wrong. My younger one is almost 4 1/2 now and from time to time he will do something or act in a way which leaves me worried too. Its all part and parcel of being a MOM...You are an excellent mom !!! And don't worry about "R". He is too small and he will be an awesome kid... He has such a thoughtful mom behind him! Your son is in his 2's, right ! Its not for nothing that they call it the terrible twos...Tantrums are a done thing, and perhaps the first time on stage made him do something he never would have otherwise..Its important to discipline kids, setting some rules right in the beginning really helps, it slowly will fall in place, don't worry so much ! This is a beautiful looking curry...I have bhetki fillets, can you give me some ideas on what I can make with it ? Loved your snaps , too exotic. 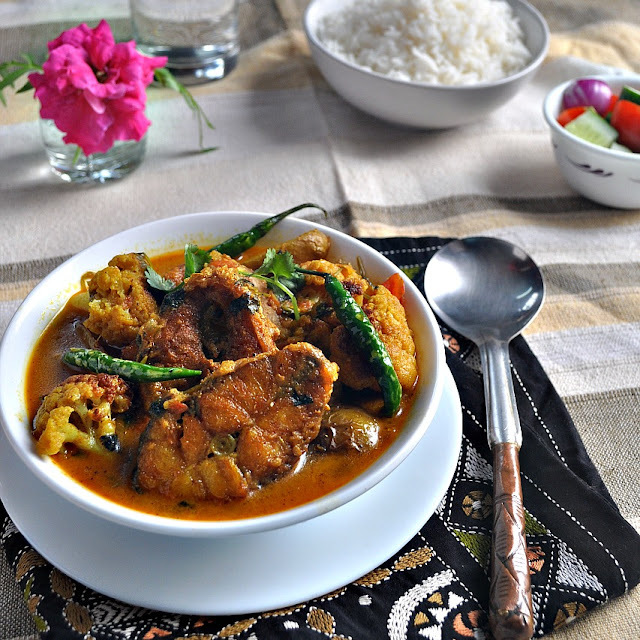 Real real authentic recipe Sayantani..I loved this too.Since I am a big fish savvy,you can guess.I bookmarked.Yummy.Thanks. Macher jhol looks ultimate!! Thanks a lot for sharing this wonderful recipe. Dekhte darun hoyeche. 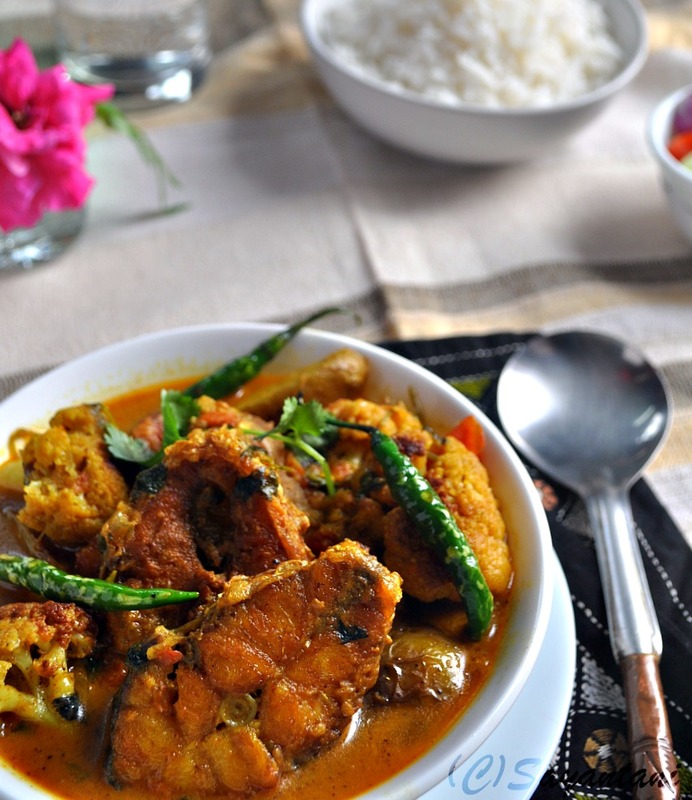 delicious fish curry...adding vegs is interesting...never tried this way!! kore khelam..age jantam na korte,odbhut laglo kheye. thanks everyone. its a difficult phase of time indeed. this is the time when they get their shape and all we want is the best for them. glad that you all think its normal. happy to have some company here. @Arch. will mail you today for some bhetki ideas. @Bhakt, advut laglo ta bhalo na kharap? 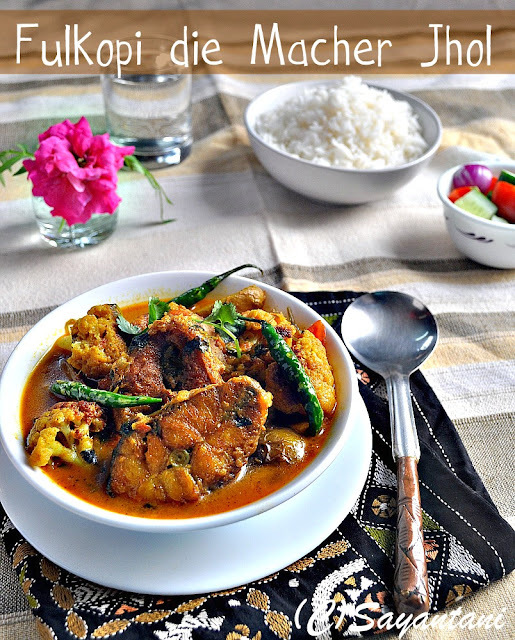 Fulkopi diye macher jhol dekhei khete ichha korchhe.Nice presentation. Curry looks delicious and mouthwatering! Curry is packed with protein & fiber. For some reason, we don't add veggies to seafood or meats with the except of fresh green peas and lima beans. Come on Sayantani...your kiddo is just a toddler! He needs to be like a kid and not a grown up! Give him the space and the time...he is fine and will be fine. A mother like you can never go wrong. Your curry looks just perfect..I wish I could cook up such good fish curries..my son is an ardent seafood lover and I feel a bit sorry form him as I do not manage cooking non-vegetarian food to his taste:( Wish you were around..he misses his Mukherjee Aunty(my friend) who has returned to India. 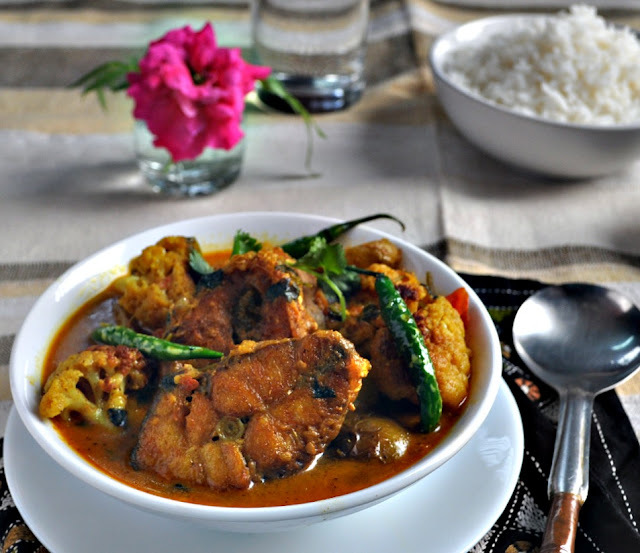 Delicious fish curry with mouthwatering presentation,nice combo looks so yummy. awesome curry...love fish curries and this twist sounds very nice! It is just normal for the little one. I love the light gravy fish curry. 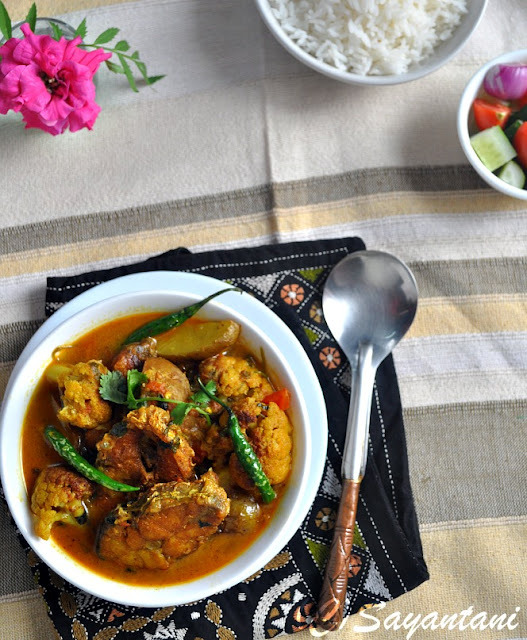 Growing up in Orissa, my mom used to make such delicious curry with Rohu fish. Absolutely love it! Just cooked this today but I make it without the onion but thank God I made it otherwise, tomar maacher photo dekhe khoob lob lagto after all tomader Kolkatar maach Bombayer maach noi, Kolkatar maacher kotha alada. 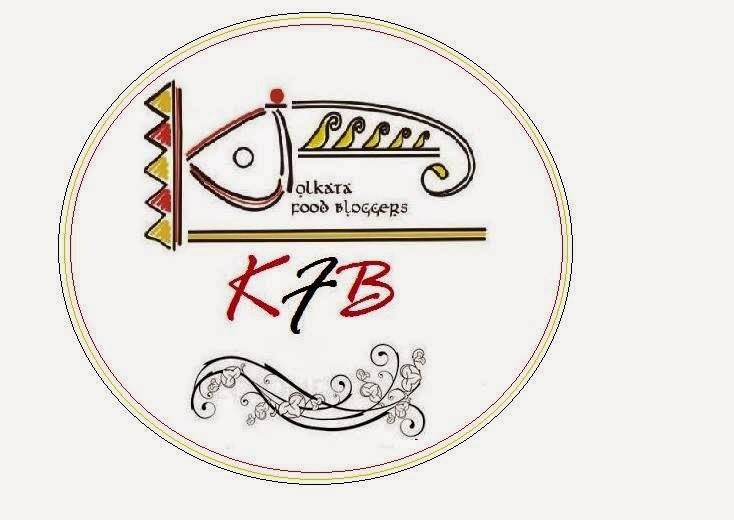 Thanks shilpidi, eta thik katha sweet water fish ta kolkatay khub bhalo paoya jay. akdom fresh. akbar chole eso ekhane...ami banie khaoabo. fish with cauli is one excellent combo and you made it so well. I see i am commenting to this post after a long time. But what i mostly i saw in the comments that he/she is a sea food lover. So i just again remind you guys that its not at all a sea food recipe. This kind of recipe is mostly famous in Eastern part of India.. where Fresh water fish is being consumed and very less sea fishes. Infact "Sayantani" has already mentioned of it but still people thinks of any fish which comes to their mind. Thank you somuch. Much appreciated!!! How did you get that colour to the fish when you fried with such less oil? Mine turned out an insipid yelloish colour. @Aseem, smear salt and turmeric and marinate it at least for 15 minutes. Then fry on low flame till golden on each sides(3-5 minutes each sides). I generally cook in non stick pans and kadhais and it wont need much oil. The fish pieces that you see in this dish are big rohu (mainly from Andhra) which are quite oily. try frying them on low heat for 7-10 minutes depending on its size. you definitely will get the colour. Fantastic recipe - I couldn't get hold of my mother on the phone, so had to search the internet and came across your recipe - I love to cook fish without onions (mostly), so did exactly as your instruction in the footnote i.e. increased the amount of ginger paste - also, I added a couple of "shukno lonka", a couple of bay leaves and a couple of cardamom pods to start off as "phoron" - it's exactly how I wanted it to be - thanks once again!! !